Here in Virchester we place great emphasis on relieving suffering in our patients. Part of doing that involves reducing the pain many of our patients experience. This seems particulaly important in our paediatric population where relief of pain as soon as possible seems especially important. This is not a major issue for mild and moderate pain as oral medication is usually adequate and can be given at the front door by our triage nurses. The difficulties arise when the pain is more severe. In adults we just pop a quick IV line in and give some (usually) opiods, but that is no simple feat in a distressed child. There is no such thing as a quick IV in a distressed toddler! As always you should read the full paper which can be accessed here. The abstract is below. What kind of paper is this. It’s an RCT which we know is the best type of design to compare two therapeutic interventions. Patients were randomised using a block design to take account of ages and pain scores. Kids aged 4-17 with a significant amount of pain according to a age dependent pain scale and with extremity fractures. This is a reasonably specific group which is great for studies, but does mean that the results are limited by the patient population restrictions. It’s true that extremity trauma is probably the most common reason to give IN drugs in Virchester, but we also use it a lot in burns and some medical conditions (e.g. sickle disease). In a single US centre they managed to screen 627 patients and then recruit 91, and complete the study in 87. Then only 82 completed the study to the primary outcome. That is a small proportion of those screened which at first glance looks dodgy, but I think this is just good reporting. The exclusions were a-priori exclusions and thus not a major concern from a methods point of view. Patients received either 1.5ug/Kg Fentanyl or 1.5mg/Kg Ketamine via the intransal route made up to a max of 1ml. All drugs were administered using an atomiser. Interestingly, and really importantly the nurse who administered the drug knew what the intervention was. Local policy meant that they could not be unblinded – this is a problem. All patients received oral analgesai as well as the IN medication. Pain scores were taken every 5 mins for 20mins, every 30 mins for 2 hours and then again at 6 hours or discharge. Age appropriate pain scales were used to assess pain. If we think about pain then there is little or no difference between the two drugs. However, these are small numbers and they are not high enough for us to say that they are equivalent. The authors point this out and argue for a non-inferiority trial larger enough to determine this (if we subsequently decided it’s important). In terms of side effects then Fentanyl wins. The incidence of side effects such as bad taste and dizziness are far higher in the ketamine group (90% vs. 22%, and 73% vs. 15%). That is arguably to be expected but the difference is larger than I thought it would be. The study looked at 13 different side effects and interestingly every patient who had ketamine reported something whereas about 2/3 of fentanyl patients reported. However, it’s unclear how distressing these side effects were. They are clearly not serious in terms of physical health and I just don’t get a feel of how much of a problem they would be for staff, parents and of most importantly patients. It’s great to see an RCT in kids on an important issue like this. The study is too small to draw firm conclusions and I agree with the authors that if we really want to determine non-inferiority then a larger multicentre study is required. I am worried about the lack of blinding in the study as I think that could introduce significant bias into the reporting. The non consecutive recruitment also potentially creates bias. So what would I do? Well in Virchester we use Diamorphine and so this is not going to change my practice as neither drug studied here looks to be better than what we currently use, though I’d love to see a three armed RCT of Diamorphine vs Ket vs Fent to really answer that question. I would say that we probably still under-use the intranasal route. I think it’s pretty well established in paed practice but we should also remember that we can use it in adults too. 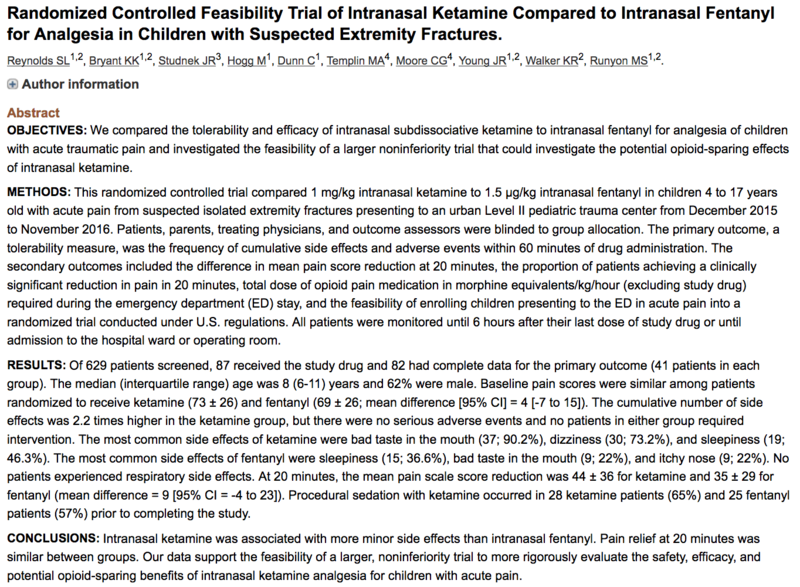 If I only had access to Ketamine and Fentanyl then I would err towards Fentanyl on the basis of this study but that would be a fairly weak recommendation. 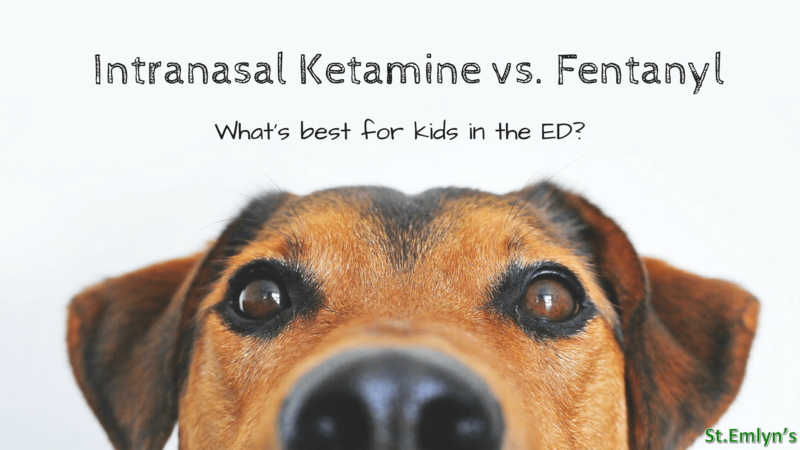 Robinson A. Intranasal Ketamine: Mum “Nose” Best at St Emlyn’s. St.Emlyn’s. http://www.stemlynsblog.org/intranasal-ketamine-mum-nose-best-at-st-emlyns/. Published 2012. Accessed 2018. The write up is pitched as a kind of pilot study. Stats wise, a non-inferiority study actually requires less patients as you are only looking at one side of the expected normal distribution. And a minor point of detail- it was 1mg/kg ket v 1.5mcg/kg fent. Not convinced the nurse not blinding would bias severely- they were not data collecting or assigning? Bottom line- it does raise the possibility of using it pre-sedation instead of IM……? Fentanyl is so good though so why bother with a drug that definitely can and does make a lot my kids go a bit nuts.